A NEW list of fixtures for the Macleod & MacCallum North Caledonian League and its cup competitions has been released for dates up to the end of February. St Duthus will kick off November with an away trip to play Bunillidh Thistle in the first meeting of the clubs for many years. The Saints will then have a free weekend on November 11th while league action continues, but will be back on the 18th away to Invergordon in the league. The first round of the North Caledonian Cup will be played on the 25th with St Duthus traveling to Helmsdale to play Bunillidh. In December, Orkney will visit Tain on the 2nd before St Duthus travel to Alness on league business on the 9th. The last game of 2017 will be played up in Caithness against Thurso. 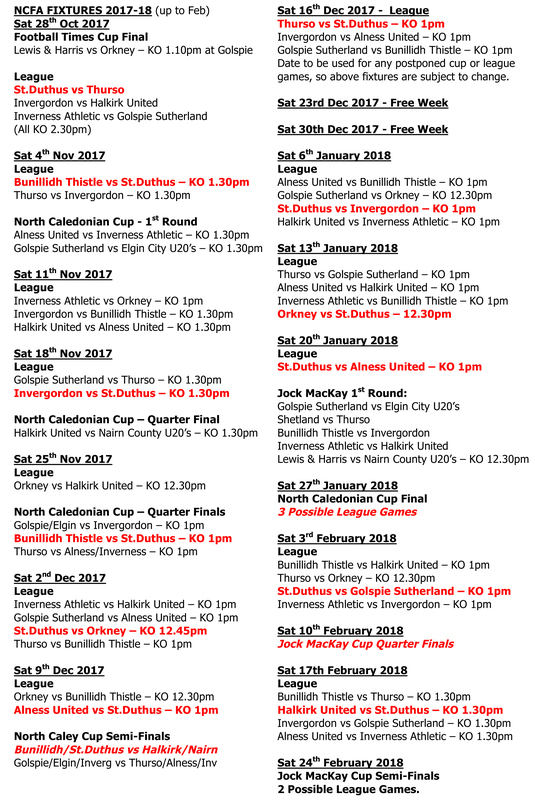 The new year begins on January 6th with an Easter Ross derby between Invergordon and St Duthus at the Links, and on the 13th January, Saints will do the round trip to Orkney. A full list of the fixtures up to February can viewed on the North Caledonian League website here. The St Duthus confirmed fixture schedule can viewed here.